Edizioni Insubrica Historica is an independent publisher, founded in 2017. Its mission is to focus on historical heritage of the Insubrica region. We aim at promoting historical contents in different languages. Our aspiration is to change the way readers perceive fundamental historical issues and personalities, providing exclusive details related to the Insubrica region. 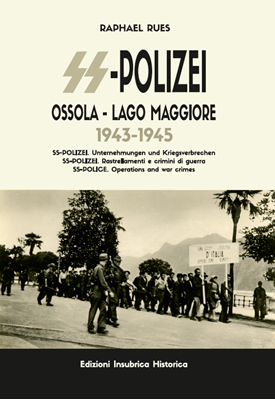 The book puts emphasis on history of SS-Police Regiment operations and war crimes committed in the region of Ossola and Lago Maggiore in northern Italy from 1943 till 1945. Prior to arriving in the region, the SS-Police regiments had fought on the eastern front where they were extensively involved in the genocide of Jews and massacres of Soviet citizens. Available in three languages, the book presents a breathtaking story of German troops, including extremely rare photographs and unique maps. This is a work of extreme importance because it does not only cover a substantial gap in the knowledge related to the regions of Ossola and Lake Maggiore during 1943-1945 but it also allows us to comprehend in a more complete and precise manner the main events of the war conflict. Raphael Rues has rigorously analysed the primary sources related to the war operations of the SS-Police, the German military body, that conducted activities against the partisans in the regions of Ossola and Lake Maggiore from the end of 1943 till the spring of 1945.